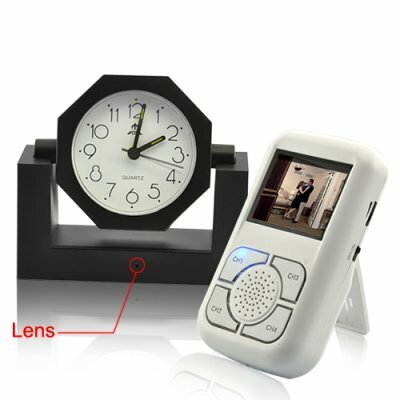 Successfully Added Wireless Camera Alarm Clock with 2.5 Inch LCD Receiver to your Shopping Cart. Would you like to find out who's been sneaking around your room or sleeping in your bed? This cool standard looking alarm clock, packs more than just the time. Have we have already got your imagination going wild yet? There is no doubt that the camera alarm clock with receiver has many desirable applications. We all enjoy playing James Bond, in this case you may "enjoy" the item yourself, catch someone in the act, or simply use its features for the purpose of security in your home or office. Receive crystal clear video with the wireless 2.5 inch LCD screen and see some of the minute details of the cameras surroundings.